It is sometimes said that necessity is the mother of invention. And so it was with sodium bicarbonate's discovery as a gentle abrasive suitable for cleaning materials of coatings and contaminants without damaging the underlying substrate. In the mid-1980s, engineers restoring the Statue of Liberty required a method of removing layers of coal tar epoxy from the interior of the statue without damaging its copper plating. ARMEX™ baking soda was successfully used to strip away these layers without harming the metal's structural integrity. An industry was born that would soon find applications in restoration, remanufacturing, industrial cleaning and cleaning food industry machinery, among many others applications. Sodium bicarbonate's use as a soft but effective cleansing agent stems from its inherent softness compared with most other abrasive materials. Baking soda rates 2.5 on the Mohs scale of hardness—just above talc and well below traditional blasting abrasives such as silica sand, mineral slags, and glass beads. Delivered under relatively low pressure, but high velocity, specially formulated sodium bicarbonate crystals shatter upon impact, delivering their energy along the substrate rather than into it. This action enables paint, dirt, grease, burnt on carbon and contaminants to be removed efficiently without damaging the material beneath it. Larger-sized particles yield more penetrating power, making these ("XL") formulas appropriate for thicker coating removal and heavier cleaning applications. 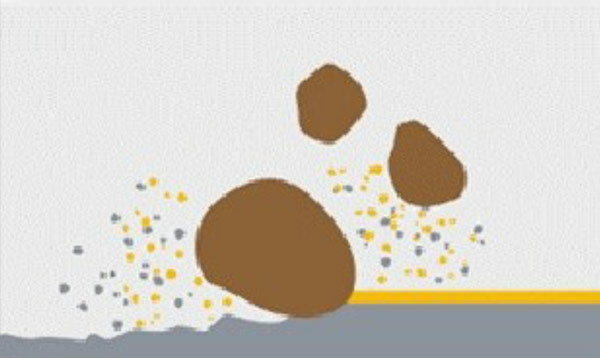 Medium-sized particles are suited to thinner coatings on more sensitive substrates, such as wood or aluminum, as they carry less mass but deliver more hits per square inch to the material being cleaned. Smaller particles are used in specialty formulas for very specific surface preparation requirements, as well as for highly sensitive, thin, or composite materials with light coatings. Harder abrasives, such as sand, mineral slags, and steel shot or grit, generally remain intact as they impact the substrate, which can result in pitting, tearing, etching, erosion, and other damage to the material's surface. The frontal impact of such abrasives can also generate heat that can lead to warping of the substrate. By penetrating the substrate's surface, traditional abrasives can also embed the material with contaminants, including the abrasive particles themselves, during dislodging of the coating. Recycled abrasives, such as steel grit or glass beads, can exacerbate this problem by loading additional contaminants into the substrate. Soda blasting generates little to no heat, avoiding the potential for substrate warping. As a non-penetrating, single-use abrasive, it will not perforate the substrate nor introduce contaminants into it. And because it is typically water-soluble, spent soda can easily be rinsed and dissolved to eliminate the possibility that any particles will clog the tiny passageways of machines or intricate parts that are being cleaned. Sodium bicarbonate's unique characteristics make it safe and effective for use in cleaning and de-coating a wide variety of substances from a range of substrates. Oil, grease, dirt, dust, grit, paint, wax, and rust can be removed safely and efficiently without damage to materials ranging from stainless steel to aluminum, brick, stone, masonry, glass, fiberglass, wood, plastic, and rubber. 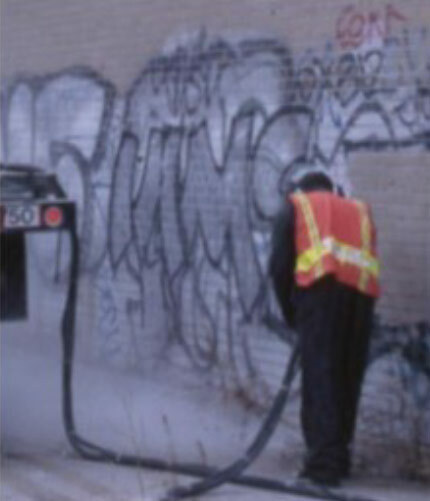 Graffiti removal—Soda blasting's ability to remove one layer of paint at a time allows graffiti to be cleaned from a wall or building without disturbing the paint beneath or otherwise damaging the brick, stone, or masonry. Cleaning of machined parts—Sodium bicarbonate will not dent or warp the part's surface nor change its engineered tolerances, dimensions, shape, or contours. Scrubbing metal surfaces for crack inspection/detection—Unlike some abrasives, soda cleans without filling cracks, making for easier fault identification. Cleaning aerospace components—Soda blasting can remove paint and/or grime without damaging anodized coatings. De-griming of intricate and rotating equipment—Unlike some chemical solvents, sodium bicarbonate is benign to both ferrous and non-ferrous materials. Its solubility and flush ability prevent it from becoming lodged in the narrow channels of critical parts such as engine blocks—preventing damage to these components and precluding the need for some of the disassembly of such parts prior to cleaning. In addition to eliminating the potential for damaging most substrates, sodium bicarbonate's ability to safely clean multiple surfaces reduces cleaning time where such materials are co-located within close proximity of each other. 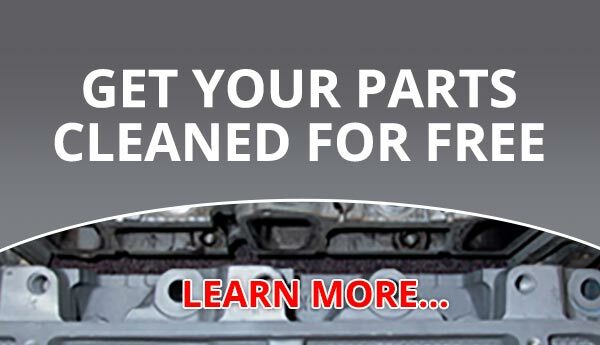 Rubber seals, plastic gaskets, and metal bearings can thus be cleaned efficiently alongside most ferrous, non-ferrous, and composite materials without being masked or removed before cleaning.